What does the CEO know that led him to add a million shares to his stake in the gaming giant? There hasn't been a lot of good news for Wynn Resorts' (NASDAQ:WYNN) investors in the past year. VIP players in Macau have dried up, which has decimated revenue and earnings, and as a result, the stock is down 57%. But the market got a surprise late Tuesday when Steve Wynn bought 1 million shares of the company's stock. 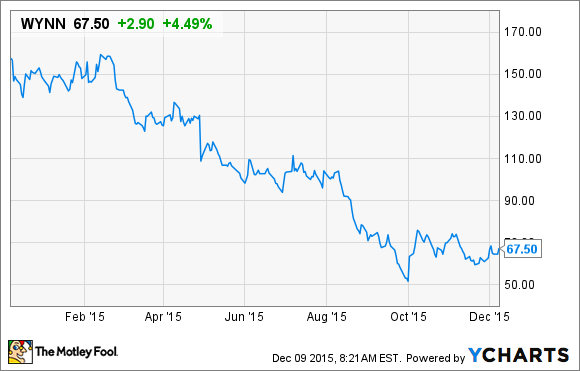 Could this signal a turnaround for Wynn Resorts? Insider stock purchases are often seen as a good sign for a company. Insiders clearly know more about a company's operations than outside investors, and if they're bullish about a company's future, why shouldn't we also be bullish? Or, that's the thought. In this case, not only is Steve Wynn bullish on his company, he's putting his money where his mouth is. That 1 million share buy represents a 10% increase in his 10.07 million share stake in the company, and accounts for nearly 1% of the 101.6 million shares outstanding. That's a level of investment some companies announce in a buyback program, so a CEO putting that much of his own money into the stock has to be viewed as a good sign. We know that Wynn Resorts has struggled in Macau of late, but Steve Wynn's confidence may stem from the outlook for Macau Palace, currently being constructed in the peninsula's Cotai Strip. The resort will be the crown jewel of Wynn's empire, and if the company's new property outperforms its neighbors -- as its resorts tend to do in Las Vegas and on the Macau Peninsula -- it could generate between $1 billion and $1.5 billion in EBITDA when it opens in the middle of next year. A lot of investors have abandoned Wynn because of its declining revenues from Macau, but Wynn Palace is a game changer. It will more than double the company's footprint in the world's richest gaming market, and if its opening coincides with a turnaround on Macau, it could lead to incredible growth for the company. The other factor to consider with Steve Wynn's purchase is that he may see this as an opportunity to gain even more control of his own company. Over the last three years, he's seen his former partner, and owner of 19.7% of Wynn Resorts, Kazuo Okada have his shares redeemed because of what was deemed unethical behavior as he tried to open his own casino in the Philippines. Earlier this year, Steve Wynn's ex-wife Elaine tried to sell some of her 9.5% stake in the company, which has its votes tied to Steve Wynn, and was booted from the board of directors. A few years ago, Steve Wynn had friendly ties with holders of nearly 40% of his company (including himself). Suddenly, he was down to a smaller 10% stake. That's not a comfortable position to be in, especially given his experience with the hostile buyout of Mirage Resorts, something he couldn't stop because he didn't own enough shares. This is a move that boosts his own ownership, and if it also boosts the share price a bit, that would make the company a little less attractive to potential buyers. This is a vote of confidence in Wynn Resorts, but I've long thought that the company is well positioned for long-term investors. Despite the drop in gaming revenues from Macau, the tiny peninsula's gaming market is still the most profitable in the world, and Wynn Palace should be a very solidly profitable resort when it opens. Maybe that's what Wynn is bullish about, maybe he knows something we don't, or maybe he just wants to strengthen his control of his company. Whatever the reason, I'll stay long Wynn Resorts stock because I think it has a lot of potential for both revenue and earnings growth for long-term investors.